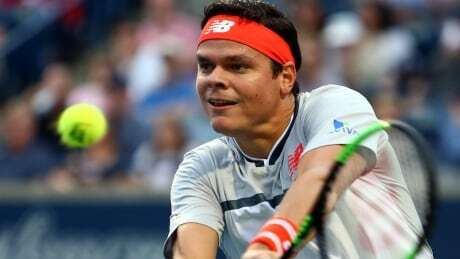 Canada's Milos Raonic cruised into the second round of the Western & Southern Open tennis tournament with a 6-3, 6-3 win over Serbian qualifier Dusan Lajovic on Tuesday. Raonic, from Thornhill, Ont., converted 95 per cent of his successful first serves into points, including 13 aces. He converted three of five break-point opportunities while never facing break point himself. Playing in his first match since retaking the mantle of top-seeded Canadian on the ATP Tour from Denis Shapovalov, Raonic completed the 57-minute win by breaking Lajovic in the final game. Raonic, ranked 29th in the world, next faces lucky loser Malek Jaziri. The Tunisian had a bye into the second round, replacing top-ranked Spaniard Rafael Nadal in the main draw. Shapovalov, from Richmond Hill, Ont., was scheduled to face Britain's Kyle Edmund in a second-round match later Tuesday. Edmund and Shapovalov had faced each other five times heading into their latest match, with the Canadian holding a 3-2 edge.